A death cross is an instance when Short-Term Moving Average (MA) dips below the Long-Term Moving Average. It shows that the current short-term downward trend has now become a long-term trend, suggesting a persisting bearish market. Bitcoin is very close to its death cross. Its 50-day MA is about to cut the 200-day MA from the top. Meaning, the short-term bearish movement is turning to become a long-term trend. Does this means the doomsday for all the cryptocurrency investors is right around the corner? Likely not. This is the not the first time Bitcoin charts has shown the death cross pattern. In September of 2015, its 50-day MA cut 200-day MA. Back then, after the “bearish crossover,” its price remained low and stagnant for 10 months. However, after that, its price rallied back to its All Time High (ATH) then, increasing in value by 40 percent the same year. 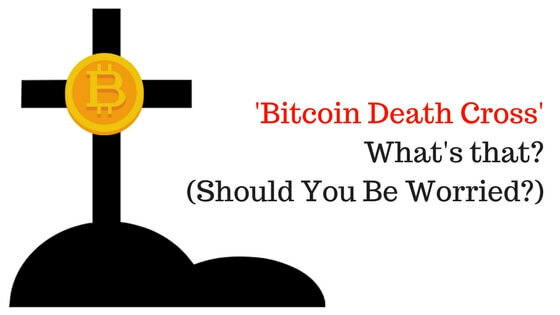 Is Bitcoin Death Cross A Bad Sign? 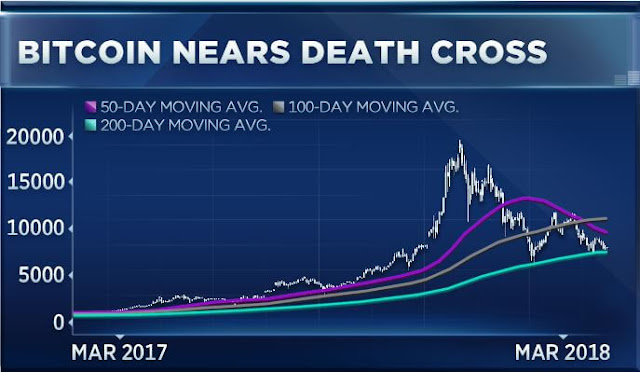 Many experts are seeing a death cross as a critical warning for the Bitcoin and its sustainability. “Any time the 50-day crosses the 200-day, it should flash a warning…and when you couple that with the fact that Bitcoin has been trending steadily lower since the launch of futures, I think that it is a major negative,” said Jim Iuorio of TJM Institutional Services to CNBC. But there are also many who believe the current market trend is a bear trap. The 50-day Moving Average of Bitcoin will crossover the 200-day Moving Average. It will likely happen in the past few days. And when that happens, we could possibly see another major sell-off, taking Bitcoin price to as low as $3,000. But that being said, the chances of a mass sell-off of that size doesn’t seem like happening right now. So that would keep Bitcoin in the oversold condition. And in that case, like we saw in 2015 and 2014, after the death cross Bitcoin, we could see a reversal. The cryptocurrency can soon rally to the $8000 territory, jumping high even further. At press time, one Bitcoin is trading at $6,474 on Bitstamp. It seems like bottoming out right now. However, if we do see another wave of sell-off, the price can touch the $6000 mark. All in all, the speculations are high as Bitcoin approaches its Death Cross. Traditionally, the charts say that it’s a bad sign when 50-day MA cuts 200-day MA line. But with the track record of Bitcoin, it suggests the once the bearish crossover happens, its price can rally high soon after.